Description: Having no experience in romance, the vibrant Ninako curiously explores the meaning of what "love" really is, and is surprised to feel a colorful range of emotions as she grows closer to the school heartthrob, the quiet yet gentle Ren, who also happens to be involved in a longtime relationship. With every intention of keeping her head held high, Ninako prepares to face the mental pain of this one-sided love that she had allowed to take root, facing a series of trials that would either contribute to her growth as a headstrong woman, or break her as it did with other girls. However, is this really a one-sided love? Or had something been silently sown in the most hidden part of Ren's heart? Review: Strobe Edge is a sweet, straight-forward shoujo manga. It is relatively short compared to standard manga series, completing at ten volumes. The focus of Strobe Edge is examining all the emotions that surround the concept of love, both familial and romantic. Readers familiar with shoujo manga will immediately recognize its familiar tropes: a budding romance between the dashing yet aloof hero, the sweet, flighty heroine who eventually wins the hero over by her quiet strength and generous heart, and large doses of unnecessary drama until the happily ever after ending. Unlike other shoujo mangas that I've read, Strobe Edge has surprisingly very little drama, but it is full of heart and emotions. Ninako begins to develop a crush on Ren, one of the most popular and cutest boys in school, after he notices her when he accidentally breaks her cell-phone charm and then replaces it. This generosity from the school's otherwise silent "pop star" distracts Ninako from Daiki, the boy who's been there all along, and makes her start becoming more aware of what love should feel and look like. As the story progresses, Ninako evolves from being a stereotypical shoujo heroine into someone who gains maturity and clearly articulate her feelings with honesty and passion. Unlike her female classmates who fall for Ren because of his physical looks, Ninako falls for Ren for his acts of kindness, his quiet and shy personality that others claim is his arrogance. Of course happily ever after is a long road for Ninako, as she discovers that Ren has a girlfriend and is committed to her. Instead of finding ways to sabotage Ren's relationship, Ninako finds a way to turn her unrequited love into friendship and never wavers for her love for Ren until the opportunity presents itself. 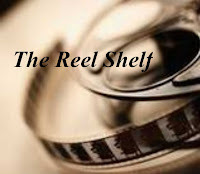 Through the secondary characters and their relationships, we see how love can be successful and disastrous as well as how they envisioned on what love is suppose to look like which I found to be interesting. 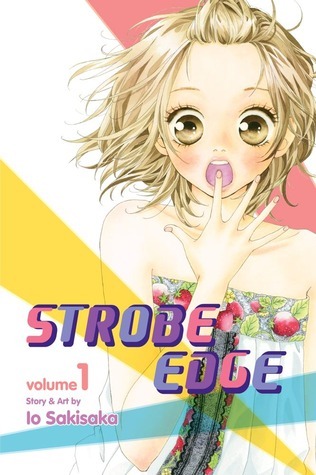 The illustrations of Strobe Edge has the typical manga look with characters that have large eyes, crazy hair colors, and pointy hair, but the panels are filled with life and action. The best parts of the book are the closeup, wordless panels that the author creates that allow the physical features of the characters to emote and tell the story where words seem to fail them. Overall this manga is a sure winner for readers who seek a cute romance with very little drama and angst. Words of Caution: There is some crude sexual humor and minor language. Recommended for Grades 8 and up. Ha ha. Crude humor. I had no idea. Wordless panels in books like these are what, I think, make illustrated books work so well. You always make me curious about manga when I read these posts!